With his Renaissance men Brian Schneider and Eric Iverson doing most of the shaping of greens and bunkers, and Brian Slawnik running the job and handling the finishing touches, Doak's team beat the northern Michigan weather to plant all 18 holes in a single summer. "I could just drive over from Traverse City in the morning, tinker with two different greens the same day, and still get home to sleep in my own bed," smiled Doak. "So it all came together a lot faster than having to go to New Zealand and back, even though we did have to think through two different approach shots to every green." "Tom's reversible course concept changed our business model from a simple stop on the way single golf course, to a leading golf destination with a three-course experience different from anything else in the world right now,” Thompson said. 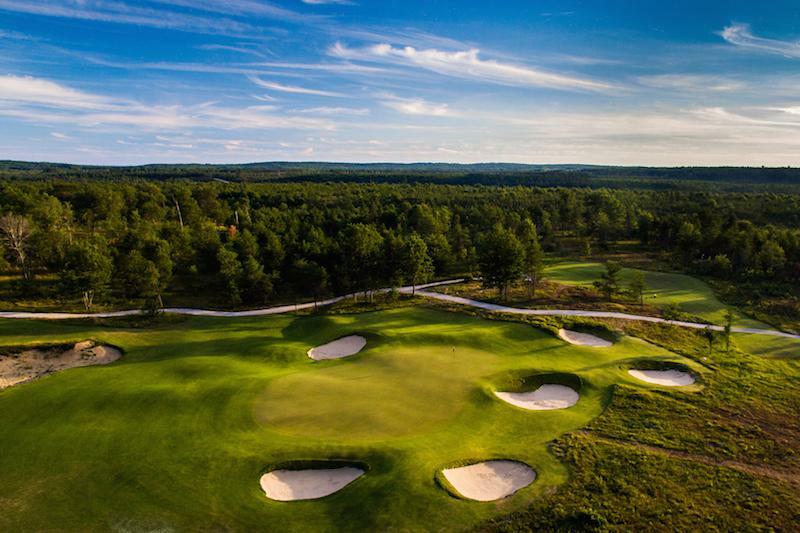 Nestled on 1,300 acres of heavily wooded land within the Huron National Forest, Forest Dunes has become one of the country's premier golf experiences. In this pristine setting, Tom Weiskopf designed one of his top layouts featuring rugged native dunes, scruffy sand areas and water features. The course has been consistently ranked among the best courses by the leading golf publications. Golf Digest, which ranked its original Weiskopf course the Best New Course in the Country when it opened in 2002, currently ranks it No. 23 among its top public courses, and GOLF Magazine and Golfweek have also ranked it among their Top 100 courses. The unique and reversible Tom Doak design, The Loop, adds a second/third Best New Course to the golf experience at Forest Dunes. In addition, the property features the beautiful Adirondack style Clubhouse with Sangomore’s restaurant, Lake AuSable Lodge with 14-rooms, new golf villas, and cottages.